The SUSTAIN 3 and 7 clinical trials compared the efficacy and safety of once-weekly semaglutide relative to exenatide extended-release (ER) and dulaglutide, respectively, in the treatment of patients with type 2 diabetes (T2D). The trials included a series of clinically relevant single and composite endpoints focused on improving glycemic control and reducing body weight, while avoiding hypoglycemia. The present study combined SUSTAIN 3 and 7 outcomes with short-term treatment costs to evaluate the relative cost of control of once-weekly semaglutide versus exenatide ER and dulaglutide. Proportions of patients reaching three endpoints were taken from SUSTAIN 3 and 7 for comparisons with exenatide ER and dulaglutide, respectively. The endpoints investigated were HbA1c < 7.0%, HbA1c < 7.0% without hypoglycemia or weight gain, and a ≥ 1.0% HbA1c reduction with ≥ 5.0% weight loss. Annual per patient treatment costs were based on US wholesale acquisition costs from July 2018. Relative cost of control was calculated by plotting the ratio of the treatment costs and the ratio of the proportions of patients reaching each endpoint on the cost–efficacy plane. Once-weekly semaglutide 0.5 mg and 1.0 mg were most effective at bringing patients to each of the three endpoints across both SUSTAIN trials. The efficacy-to-cost ratios for once-weekly semaglutide 0.5 mg and 1.0 mg were also superior to all comparators when assessing both the single endpoint of HbA1c < 7.0% and the two composite endpoints including weight loss and hypoglycemia. The present study showed that once-weekly semaglutide 0.5 mg and 1.0 mg offer superior cost of control versus exenatide ER and dulaglutide in terms of achieving single and composite endpoints, based on an analysis of retrieved dropout data. 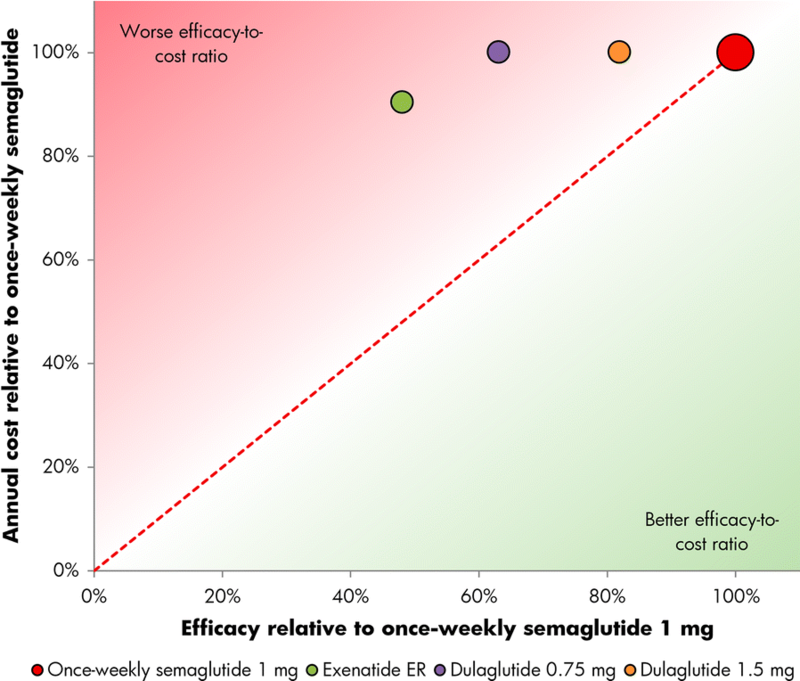 Once-weekly semaglutide 0.5 mg and 1.0 mg would therefore represent good value for money in the USA, particularly in the attainment of multi-model T2D treatment goals. To view enhanced digital features for this article go to https://doi.org/10.6084/m9.figshare.7751330. This original version of this article was revised due to Retrospective Open Access. In 2017, an estimated 24.7 million people in the USA were living with a diagnosis of diabetes, representing 7.6% of the total population and 9.7% of the adult population . Direct healthcare expenditure attributable to diabetes in this patient group was estimated to be USD 237 billion in 2017, with an additional USD 90 billion associated with lost productivity from absenteeism, presenteeism, unemployment from chronic disability, and premature mortality . Of the USD 237 billion of direct medical costs, expenditure on medications represented 43% of the total, including USD 15.0 billion (6%) on insulin, USD 15.9 billion (7%) on other antidiabetes agents, and USD 71.2 billion (30%) on other prescription medication for the treatment of diabetes-related complications . Type 2 diabetes (T2D) accounts for approximately 95% of all diabetes cases, resulting in 23.5 million people with diagnosed T2D in the USA in 2017 , and in 2009, it was estimated that 91.4% of diabetes-related expenditure was incurred in patients with T2D . Given the high economic burden arising from the treatment of diabetes-related complications, and the high humanistic burden arising from the associated reductions in quality of life, reducing the incidence of diabetes-related complications has the potential to both reduce costs and improve quality of life . Large-scale trials, such as the Action to Control Cardiovascular Risk in Diabetes (ACCORD) trial, conducted in nearly 80 clinical centers in North America, and the United Kingdom Prospective Diabetes Study (UKPDS), have demonstrated that improving glycemic control results in a reduced risk of micro- and macrovascular complications often associated with T2D [5, 6, 7]. Based on evidence from large-scale trials (such as ACCORD and the UKPDS) and several meta-analyses, guidelines published by the American Diabetes Association (ADA) recommend a glycated hemoglobin (HbA1c) target of < 7% in the majority of people with type 2 diabetes. If patients do not experience significant hypoglycemia or other treatment-related adverse events, the ADA endorses a more rigorous goal of HbA1c < 6.5% . Alongside good glycemic control, the ADA guidelines also recommend supplementary targets, including improvements in blood pressure and serum lipid levels, reductions in body weight in overweight patients, and minimizing the risk of treatment-related hypoglycemia . In particular, the guidelines state that there should be a specific focus on the effects of diabetes therapies on body weight and hypoglycemia when considering multifactorial treatment targets . The glucagon-like peptide-1 receptor agonists (GLP-1 RAs) are a class of highly efficacious diabetes therapies associated with a low hypoglycemia risk and reductions in body weight, in addition to glycemic control. The ADA recommends GLP-1 RAs as a treatment option in combination with metformin for patients with inadequate glycemic control on metformin monotherapy after 3 months . Once-weekly semaglutide, a novel GLP-1 analog, received approval for use in the USA in December 2017. The efficacy and safety of once-weekly semaglutide has been evaluated throughout the SUSTAIN trial program. Cost-effectiveness analyses are becoming increasingly important to ensure that restricted resources are used optimally to maximize healthcare gains. Value-based decision-making aims to capture both the efficacy and costs of interventions, ensuring that funded interventions represent good value for money. 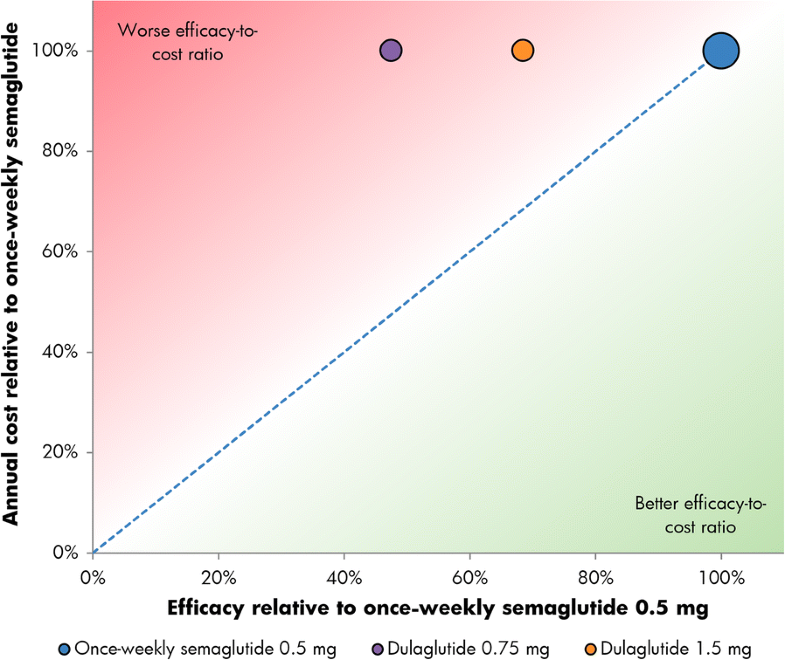 A previous cost of control analysis (a form of short-term cost-effectiveness analysis), comparing once-weekly semaglutide with dulaglutide, has been conducted in the US setting, aiming to provide useful information for healthcare payers . This was based on clinical data analyzed using a mixed model for repeated measures (MMRM) approach, prior to the approval of the final Food and Drug Administration (FDA) label for once-weekly semaglutide . The final FDA label ultimately included outcomes from the SUSTAIN trial program based on the retrieved dropout population, which encompassed patients who discontinued their allocated treatment in the analysis . In order to provide additional information for healthcare decision makers, the aim of the present analysis was to evaluate the relative cost of control of achieving three clinically relevant treatment targets in patients with T2D with once-weekly semaglutide 0.5 mg and 1 mg, relative to fellow once-weekly GLP-1 RAs exenatide extended-release (ER) and dulaglutide, based on the findings of a retrieved dropout analysis of outcomes in the SUSTAIN 3 and SUSTAIN 7 clinical trials [14, 15]. The analysis took a cost of control modeling approach, in line with a previous US analysis of once-weekly semaglutide versus dulaglutide, and previous analyses of liraglutide (a once-daily GLP-1 analog) versus sitagliptin (a dipeptidyl peptidase-4 inhibitor) [12, 16]. Based on three common endpoints used in the treatment of T2D, this approach allows the short-term cost-effectiveness of interventions to be evaluated in a clinically relevant manner that is both straightforward and transparent . Clinical data for the analysis were taken from the SUSTAIN trial program, specifically the SUSTAIN 3 and SUSTAIN 7 trials, comparing once-weekly semaglutide 1.0 mg with exenatide ER and once-weekly semaglutide 0.5 mg and 1.0 mg with dulaglutide 0.75 mg and 1.5 mg, respectively (Table 1) [15, 16]. No head-to-head trial has compared once-weekly semaglutide 0.5 mg with exenatide ER, and clinical data were therefore unavailable for this comparison. The present cost of control analysis was based on the proportion of patients achieving target endpoints with each intervention. The statistical significance of differences between treatments was assessed using a logistic regression model. In line with the US FDA label for once-weekly semaglutide, all outcomes were based on the intent-to-treat population in which missing data were imputed using multiple imputation based on retrieved dropout analysis . A model was developed in Microsoft Excel (Microsoft Corporation, Redmond, WA) to assess the relative costs of bringing a single patient to each of three pre-specified single or composite endpoints in the two SUSTAIN trials. The endpoints covered glycemic targets, body weight, and hypoglycemia outcomes: (1) HbA1c < 7.0%, (2) HbA1c < 7.0% without hypoglycemia and without weight gain, (3) ≥ 1.0% HbA1c reduction and ≥ 5.0% weight loss (Table 1). Only wholesale acquisition cost (WAC) prices were included in the analysis, and these were sourced from the Price-Rx database (Table 2) . Needle costs were not captured, as needles are included in the once-weekly GLP-1 RA packs, while no costs relating to self-monitoring of blood glucose (SMBG) testing were applied, as testing was assumed to be the same regardless of the treatment regimen. Adherence to all modeled regimens was assumed to be 100%. All medications were dosed at the weekly doses recommended in the product labels: 2.0 mg per week for exenatide ER, 0.75 mg and 1.5 mg for dulaglutide 0.75 mg and 1.5 mg respectively, and 0.5 mg and 1.0 mg for once-weekly semaglutide 0.5 mg and 1.0 mg, respectively. The analysis took the perspective of a US private healthcare payer, with outcomes projected over a 1-year time horizon. The relative efficacy for each comparator was calculated by dividing the proportions of patients achieving each of the three endpoints with the comparator by the proportions of patients achieving the corresponding endpoint with once-weekly semaglutide from the relevant SUSTAIN trial. The relative cost of each comparator was calculated by dividing the annual cost with the comparator by the annual cost of once-weekly semaglutide. The relative efficacy and relative cost of each comparator were then plotted on a cost–efficacy plane as the abscissa and ordinate, respectively (Figs. 1, 2, 3, 4, 5, 6). 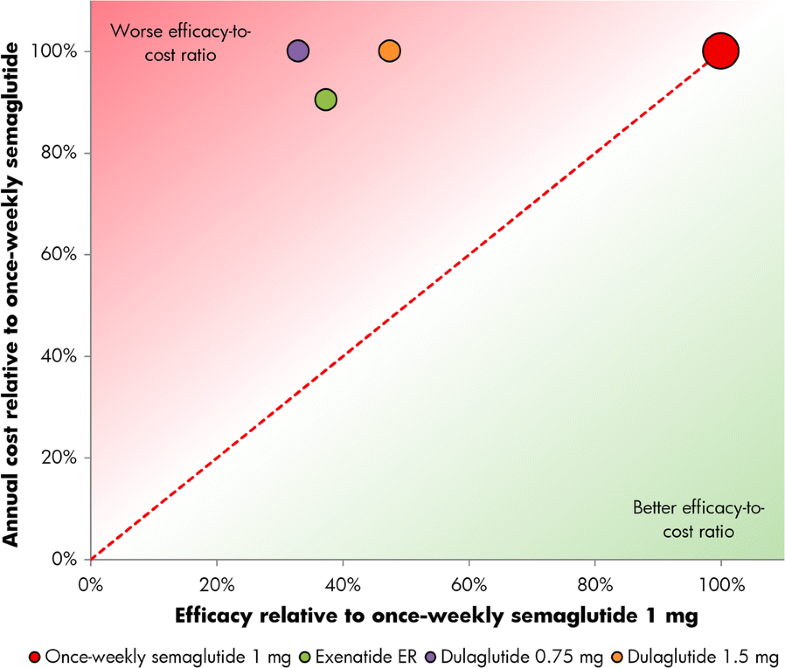 The reference of once-weekly semaglutide 0.5 mg or 1.0 mg thereby formed the identity line or line of equality (i.e., x = y), with comparators falling above the line having a worse efficacy-to-cost ratio (incurring higher costs for the same efficacy or lower efficacy for the same cost), and comparators falling below the line having a better efficacy-to-cost ratio (incurring lower costs for the same efficacy or higher efficacy for the same cost), based on an assumption of a linear relationship between cost and efficacy. This is a novel methodology, allowing easy, visual interpretation of results that has, to date, only been published in abstract form in an analysis for the Canadian setting . 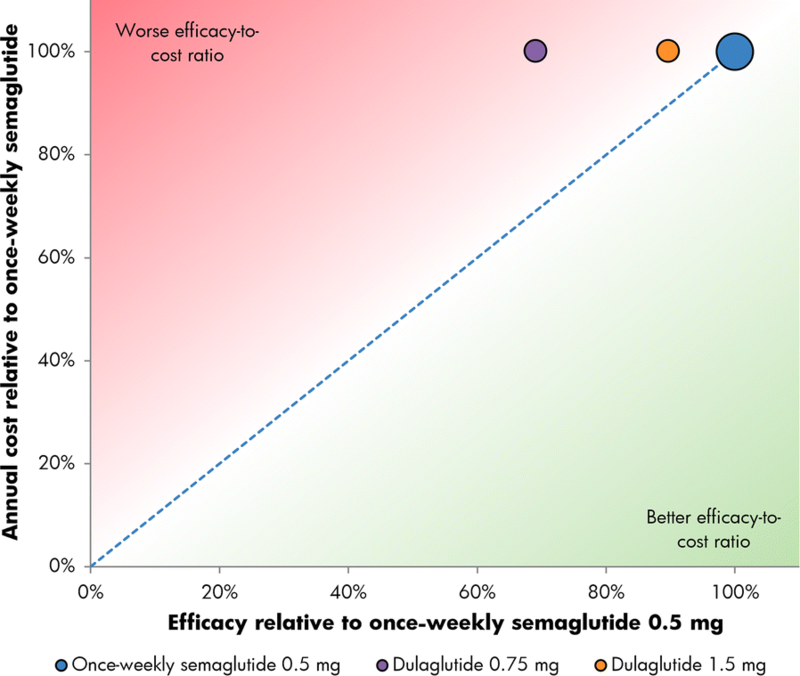 The model results were presented in terms of relative cost of control outcomes only (i.e., cost relative to once-weekly semaglutide 0.5 mg or 1 mg and efficacy relative to once-weekly semaglutide 0.5 mg or 1 mg). A constant ratio of treatment costs was assumed between the treatment arms over time to avoid differences occurring from the different trial durations, as efficacy outcomes from SUSTAIN 3 and SUSTAIN 7 were reported over 56 weeks and 40 weeks of follow-up, respectively (Table 1). While the use of cost and efficacy ratios over these time periods mitigated the impact of the different trial durations, the duration of follow-up in each trial should be considered when interpreting the results. The present modeling analysis is based on previously conducted clinical studies and does not reference any studies with human participants or animals conducted by the authors. The annual per patient cost of treatment with once-weekly semaglutide 0.5 mg or 1.0 mg was estimated to be USD 9515, compared to USD 8612 for exenatide ER and USD 9525 for dulaglutide 0.75 mg or 1.5 mg. Exenatide ER and dulaglutide were therefore estimated to be 91% and 100% as costly as once-weekly semaglutide, respectively. The annual costs of treatment were similar with all GLP-1 RAs due to the similar pack prices (all packs contain 4 weeks of treatment). The pack price of exenatide ER was USD 69.24 less than the pack price of once-weekly semaglutide 0.5 mg and 1 mg, leading to the lower annual cost of treatment. Conversely, the pack price of dulaglutide 0.75 mg and 1.5 mg was USD 0.80 higher than once-weekly semaglutide, resulting in a slightly higher annual cost of treatment. 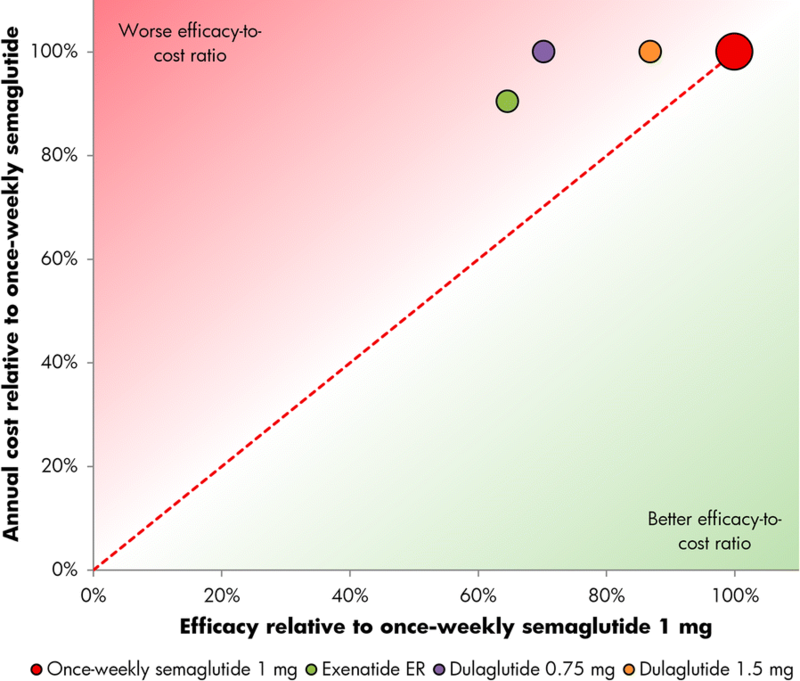 In the SUSTAIN 3 trial, once-weekly semaglutide 1 mg was more efficacious than exenatide ER across all three tested endpoints, and in the SUSTAIN 7 trial, both once-weekly semaglutide 0.5 mg and 1 mg were more efficacious than dulaglutide 0.75 mg and 1.5 mg across all three tested endpoints, based on the retrieved dropout analysis. The proportions of patients achieving the single endpoint of HbA1c < 7.0% were higher than the composite endpoints for all interventions. In SUSTAIN 3, 62% of patients achieved an HbA1c of lower than 7.0% with once-weekly semaglutide 1.0 mg, compared with 40% of patients with exenatide ER. In SUSTAIN 7, 65% and 73% of patients achieved an HbA1c of lower than 7.0% with once-weekly semaglutide 0.5 mg and 1.0 mg, respectively, versus 51% with dulaglutide 0.75 mg and 63% with dulaglutide 1.5 mg (Table 1). Relatively, exenatide ER was therefore considered 65% as efficacious as once-weekly semaglutide 1.0 mg at bringing patients to target, while dulaglutide 0.75 mg and 1.5 mg were respectively 79% and 97% as efficacious as once-weekly semaglutide 0.5 mg, and 70% and 87% as efficacious as once-weekly semaglutide 1 mg in bringing patients to an HbA1c of lower than 7.0% (Figs. 1 and 2). For the triple composite endpoint of HbA1c < 7.0% without hypoglycemia and without weight gain, 48% of patients treated with once-weekly semaglutide 1.0 mg achieved target in SUSTAIN 3, compared with 23% of patients with exenatide ER. In SUSTAIN 7, 59% and 64% of patients achieved an HbA1c < 7.0% without hypoglycemia and without weight gain with once-weekly semaglutide 0.5 mg and 1.0 mg, respectively, versus 41% with dulaglutide 0.75 mg and 53% with dulaglutide 1.5 mg (Table 1). Relatively, exenatide ER was therefore 48% as efficacious as once-weekly semaglutide 1.0 mg, while dulaglutide 0.75 mg and 1.5 mg were respectively 69% and 90% as efficacious as once-weekly semaglutide 0.5 mg, and 63% and 82% as efficacious as once-weekly semaglutide 1 mg in bringing patients to an HbA1c of lower than 7.0% without hypoglycemia and without weight gain (Figs. 3 and 4). The proportions of patients achieving a ≥ 1.0% HbA1c reduction plus ≥ 5.0% weight loss were the lowest of the three endpoints, but once-weekly semaglutide remained the most efficacious intervention. In SUSTAIN 3, 34% of patients achieved target with once-weekly semaglutide 1.0 mg, compared with 13% for exenatide ER, while in SUSTAIN 7, 33% and 48% achieved target with once-weekly semaglutide 0.5 mg and 1.0 mg, respectively, compared with 16% with dulaglutide 0.75 mg and 23% with dulaglutide 1.5 mg (Table 1). Relatively, exenatide ER was therefore 37% as efficacious as once-weekly semaglutide 1.0 mg, while dulaglutide 0.75 mg and 1.5 mg were respectively 47% and 68% as efficacious as once-weekly semaglutide 0.5 mg and 33% and 47% as efficacious as once-weekly semaglutide 1 mg for reducing HbA1c by ≥ 1.0% while lowering weight by ≥ 5.0% (Figs. 5 and 6). 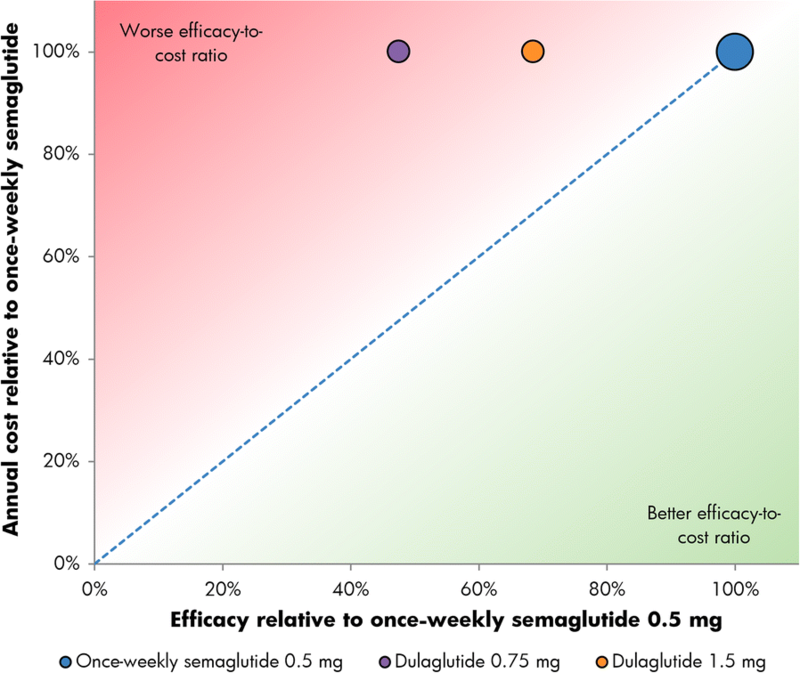 Once-weekly semaglutide 0.5 mg and 1.0 mg were associated with the best efficacy-to-cost ratios versus all comparators across all three endpoints, based on the retrieved dropout analysis (Figs. 1, 2, 3, 4, 5, 6). The present study used data from two of the SUSTAIN trials to assess the relative cost of control of bringing patients with T2D to a series of clinically relevant targets encompassing glycemic control, hypoglycemia, and weight gain. Such targets are defined in ADA treatment guidelines for T2D, with reductions in body weight and minimal risk of hypoglycemia important to consider alongside the primary goal of glycemic control (an HbA1c level below 7.0%) when identifying personalized treatment targets [8, 9, 10]. Over the two trials, once-weekly semaglutide 0.5 mg and 1.0 mg were the most efficacious interventions for bringing patients to endpoints of HbA1c < 7.0%, HbA1c < 7.0% without hypoglycemia and without weight gain, and a ≥ 1.0% HbA1c reduction with ≥ 5.0% weight loss. Both doses of once-weekly semaglutide were also associated with the best efficacy-to-cost ratios for all three endpoints. These results correlate with a previous cost of control analysis conducted with an MMRM approach in the US setting, in which once-weekly semaglutide was shown to provide better value for money than dulaglutide in bringing patients to a treatment target of HbA1c < 7% without hypoglycemia and without weight gain [12, 13]. The present analysis has now demonstrated that these results are also applicable to the retrieved dropout population included in the FDA label for once-weekly semaglutide, with results presented in a novel manner using the cost–efficacy plane. The captured costs, time horizon, and budget perspective adopted should all be considered when interpreting the findings of the present analysis. Only wholesale acquisition costs (WAC) of the drugs were used, with costs of SMBG tests, interactions with healthcare professionals, and adverse events not captured. Additionally, the presentation of data covering different periods of follow-up in the same context could be seen as a potential limitation. SUSTAIN 3 reported the proportions of patients reaching target after 56 weeks, while SUSTAIN 7 reported the same proportions over 40 weeks. While the use of cost and efficacy ratios rather than absolute differences mitigated the effect of this on the presentation of results, the differing follow-up periods should be considered in the interpretation and potential extrapolation of the outcomes. A further limitation was that the present analysis was based on threshold-based binary classifiers of glycemic control in both the single and composite endpoints. 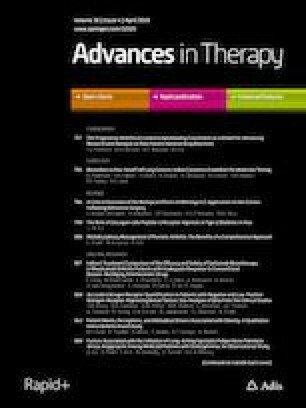 Whilst the threshold of 7% was based on the current ADA treatment guidelines and is therefore clinically relevant, glycemic control improvements observed in patients not reaching target (or not meeting or exceeding a 1.0% reduction) were not captured in the analysis (e.g., a patient achieving an HbA1c of 7.1% would receive many benefits of improved glycemic control, but would not be classed as meeting the targets included in the present study). However, given the larger proportions of patients reaching target with once-weekly semaglutide, and the lower HbA1c levels achieved relative to the other agents, this assumption is likely to be conservative from the once-weekly semaglutide perspective. Additionally, the exclusion of the long-term effects of the included interventions, including the impact of long-term diabetes-related complications on clinical and cost outcomes, could be argued as conservative from the perspective of once-weekly semaglutide. Landmark studies have shown that short-term reductions in HbA1c and body weight are associated with a reduced incidence of long-term diabetes-related complications, meaning the short-term efficacy benefits seen in the present analysis are likely to elucidate further benefits over patient lifetimes [19, 20, 21, 22, 23, 24]. Indeed, recent long-term cost-effectiveness analyses of once-weekly semaglutide have projected such outcomes [25, 26, 27]. The present analysis is designed to complement, not replace, these long-term analyses, and demonstration of the short-term benefits of an intervention with clinically relevant endpoints offers pertinent information for healthcare payers. Nonetheless, short-term analyses offer several advantages over their long-term counterparts, primarily in their simplicity, transparency, and ease of interpretation, with outcomes that are easily explainable to both patients and healthcare professionals. In addition, these analyses can be easily updated if new clinical data become available or if WACs change. Moreover, in contrast to typical long-term diabetes modeling, no long-term projections of short-term data are required, avoiding the uncertainty associated with data extrapolation. The present analysis expanded on the results of the SUSTAIN 3 and SUSTAIN 7 clinical trials, which showed that once-weekly semaglutide was more efficacious than exenatide ER and dulaglutide 0.75 mg and 1.5 mg at bringing patients to each of three clinically relevant endpoints covering glycemic control, hypoglycemia, and weight loss. 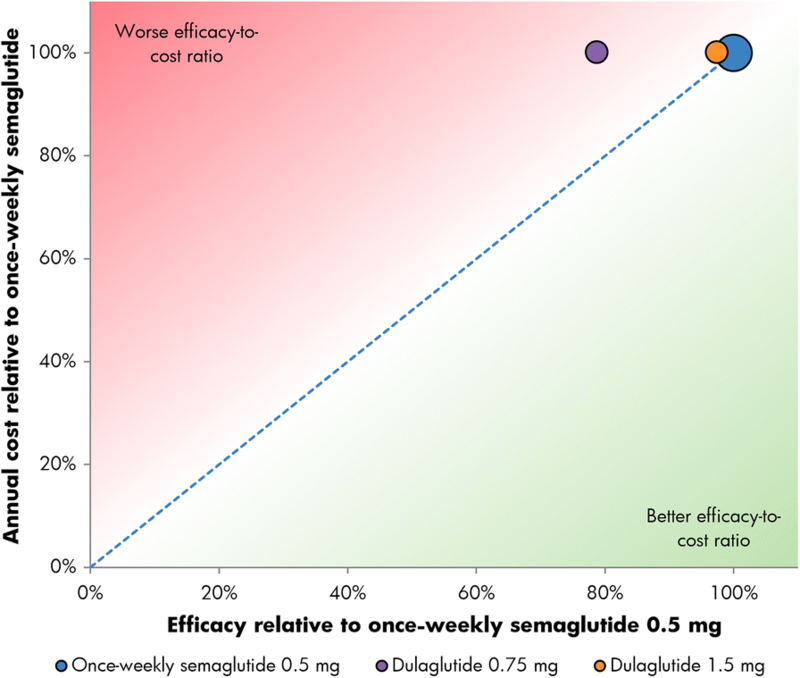 The relative efficacy and costs of each agent were assessed by plotting outcomes on a cost–efficacy plane, and this showed that the costs of control of once-weekly semaglutide 0.5 mg and 1.0 mg were superior to all comparators in achieving single and composite endpoints based on the retrieved dropout analysis. Once-weekly semaglutide 0.5 mg and 1.0 mg would therefore represent good value for money in the treatment of people with T2D in the US compared with exenatide ER, dulaglutide 0.75 mg, and dulaglutide 1.5 mg. Sponsorship and article processing charges for this study were funded by Novo Nordisk A/S. All authors had full access to all of the data in this study and take complete responsibility for the integrity of the data and accuracy of the data analysis. The authors would like to thank Samuel Malkin at Ossian Health Economics and Communications GmbH for medical writing assistance (funded by Novo Nordisk A/S). Pierre Johansen is an employee of Novo Nordisk A/S. Neeraj N. Iyer is an employee of Novo Nordisk Inc. Tam Dang-Tan is an employee of Novo Nordisk Inc. Barnaby Hunt is an employee of Ossian Health Economics and Communication GmbH, which received a consulting fee from Novo Nordisk A/S to support the study. Richard Pollock is an employee of Ossian Health Economics and Communication GmbH, which received a consulting fee from Novo Nordisk A/S to support the study. This article does not contain any new studies of human or animal subjects performed by any of the authors. Centers for Disease Control and Prevention. National diabetes statistics report, 2017. https://www.cdc.gov/diabetes/pdfs/data/statistics/national-diabetes-statistics-report.pdf. Accessed 20 Nov 2017. OZEMPIC (semaglutide) injection, for subcutaneous use. Full prescribing information. https://www.accessdata.fda.gov/drugsatfda_docs/label/2017/209637lbl.pdf. Accessed 20 July 2018. Wolters Kluwer Clinical Drug Information. Medi-Span® Price Rx®. 2018. https://pricerx.medispan.com/Login.aspx. Accessed 20 July 2018. Viljoen A, Hoxer CS, Johansen P, Malkin S, Hunt B, Bain SC. Evaluation of the long-term cost-effectiveness of once-weekly semaglutide versus dulaglutide for the treatment of type 2 diabetes mellitus in the UK. Diabetes Obes Metab. 2018. https://doi.org/10.1111/dom.13564.